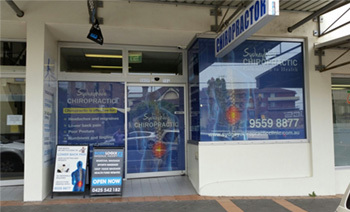 Chiropractors regularly treat sciatica. Sciatica is characterized by pain that originates in the low back or buttock that travels into one or both legs. Sciatic nerve pain varies in intensity and frequency; minimal, moderate, severe and occasional, intermittent, frequent or constant. Sciatica is generally caused by sciatic nerve compression. Disorders known to cause sciatic nerve pain include lumbar spine subluxations (misaligned vertebral body/ies), herniated or bulging discs (slipped discs), pregnancy and childbirth, tumors, and non-spinal disorders such as diabetes, constipation, or sitting on one's back pocket wallet. One common cause of sciatica is piriformis syndrome. Piriformis syndrome is named after the piriformis muscle. The piriformis muscle is located in the lower part of the spine, connects to the thighbone, and assists in hip rotation. The sciatic nerve runs beneath the piriformis muscle. This muscle is susceptible to injury from a slip and fall, hip arthritis, or a difference in leg length. Such situations can cause cramping and spasm to develop in the piriformis muscle, thereby pinching the sciatic nerve and causing inflammation and pain. Sciatic nerve compression may result in the loss of feeling (sensory loss), paralysis of a single limb or group of muscles (monoplegia), and insomnia. Since there are many disorders that cause sciatica, the chiropractor's first step is to determine what is causing the patient's sciatica. Forming a diagnosis involves a thoughtful review the patient's medical history, and a physical and neurological examination. Diagnostic testing includes an x-ray, MRI, CT scan and/or electrodiagnostic tests (nerve conduction velocity, electromyography). These examinations and tests help to detect possible contraindications to spinal adjustments and other chiropractic therapies. Chiropractic care is non-invasive (non-surgical) and drug-free. The type of chiropractic therapy provided depends on the cause of the patient's sciatica. A sciatica treatment plan may include several different treatments such as ice/cold therapies, ultrasound, TENS, and spinal adjustments (sometimes called spinal manipulation). Below are more details on these chiropractic treatment modalities. Ice/Cold therapy reduces inflammation and helps to control sciatic pain. Ultrasound is gentle heat created by sound waves that penetrates deep into tissues. Ultrasound increases circulation and helps to reduce muscle spasms, cramping, swelling, stiffness, and pain. TENS unit (transcutaneous electrical nerve stimulation) is a small box-like, battery-powered, portable muscle stimulating machine. Variable intensities of electrical current control acute pain and reduce muscle spasms. Larger versions of the home-use TENS units are used by chiropractors, physical therapists and other rehab professionals. Adjustments (Spinal Manipulation) At the core of chiropractic care are spinal adjustments. Manipulation frees restricted movement of the spine and helps to restore misaligned vertebral bodies to their proper position in the spinal column. Spinal adjustment helps to reduce nerve irritability responsible for causing inflammation, muscle spasm, pain, and other symptoms related to sciatica. Adjustments should not be painful. Techniques vary from a swift high velocity thrust to those that combine minimal force and gentle pressure. Mastery of each technique is an art that requires great skill and precision. Spinal manipulation is the treatment that differentiates chiropractic care from other medical disciplines. Sciatica can be caused by other disorders beyond the scope of chiropractic practice. If the doctor of chiropractic determines the patient's disorder requires treatment by another type of doctor, then the patient is referred to another specialty. In some cases, the referring chiropractor may continue to treat the patient and co-manage the patient's care with the other specialist.